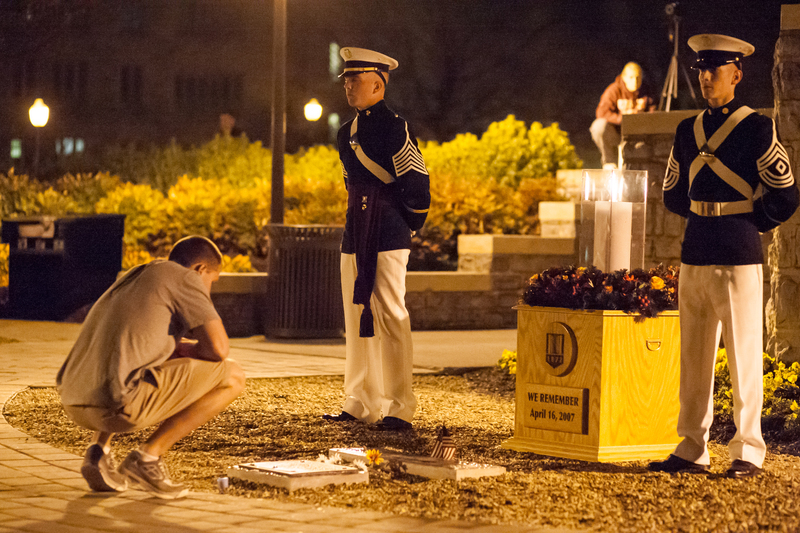 Cadets stand in front of the memorial as a student looks onto the plaque for the April 16 victims, April 16, 2013. 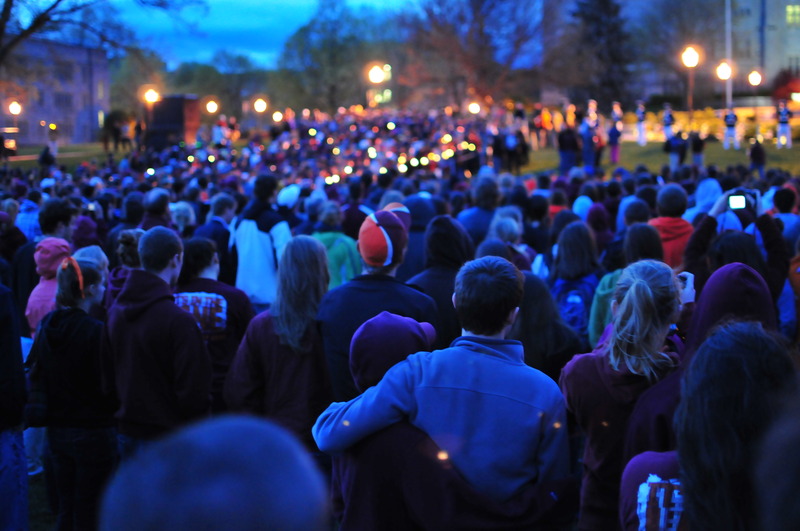 Students, families and community members stand at a candlelight vigil for the victims of the tragedy, April 16, 2011. 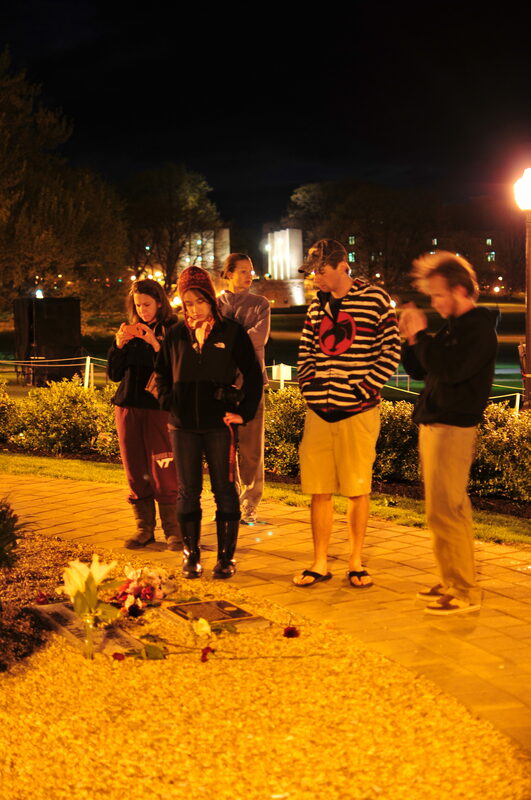 Students stand in front of the April 16 memorial, April 16, 2013. 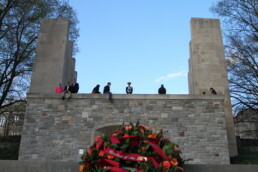 Cadets stand guard as people make their way to the April 16 memorial, April 16, 2011. With flowers and wreaths left, the memorial candle continues to burn after the vigil service, April 16, 2011. 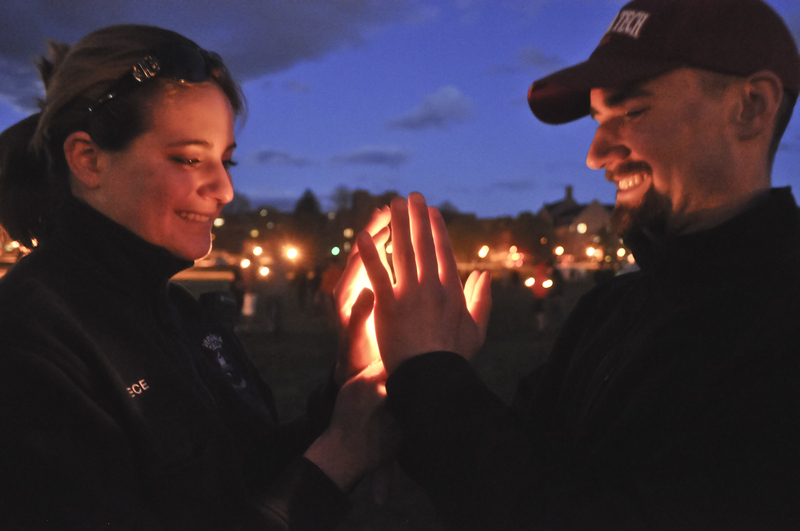 Stephanie Vice, a junior majoring in biology, and Colin Christopoulos, a freshman majoring in mechanical engineering, hold their hands around a candle to keep it burning, April 16, 2011. Students congregate on the Drillfield in remembrance of the 32 lives lost during the tragedy, April 16, 2011. 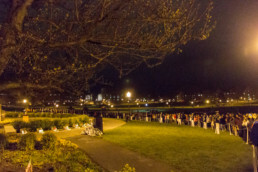 During an April 16 candlelight vigil, families and friends of the victims light candles recognizing the 32 students and facility who lost their lives that day, April 16, 2013. 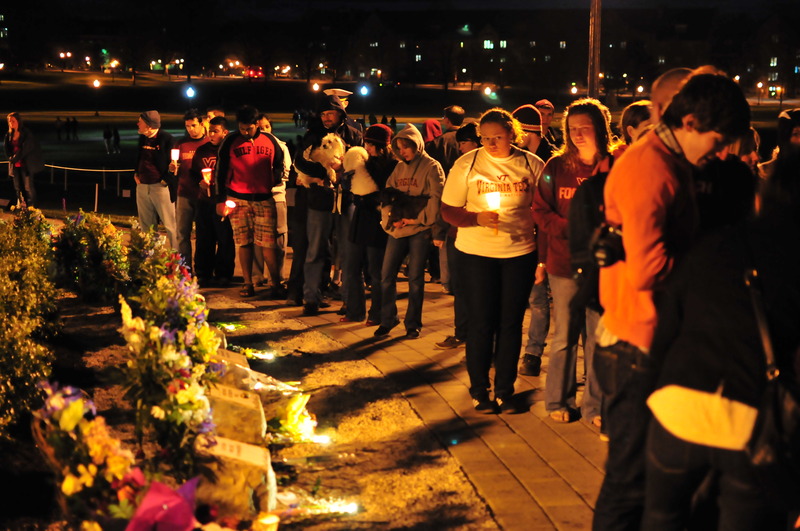 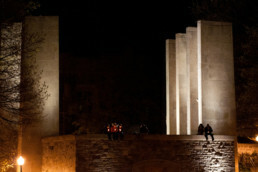 Students stand in front of the April 16 memorial during a candlelight vigil, April 16, 2011. 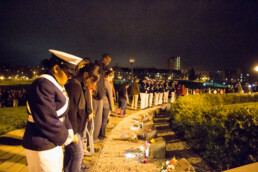 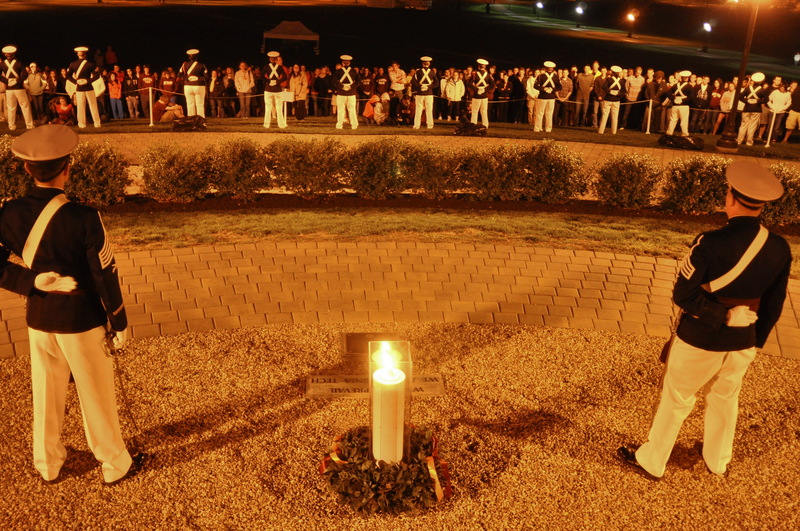 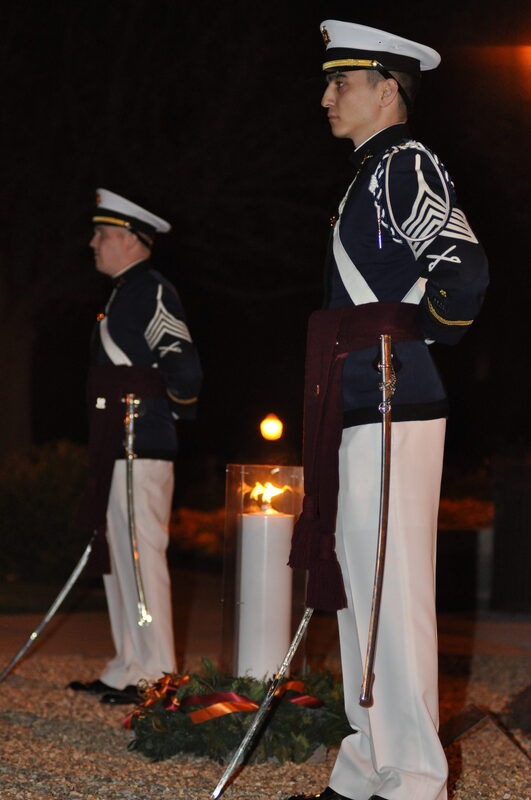 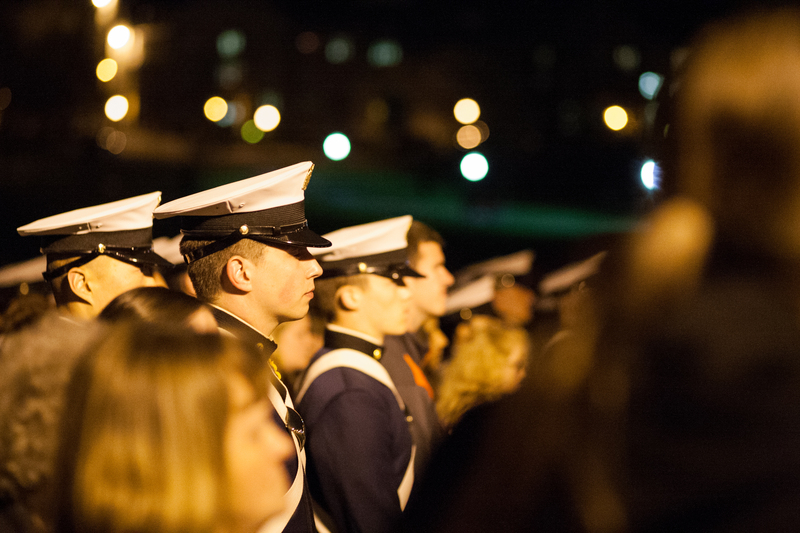 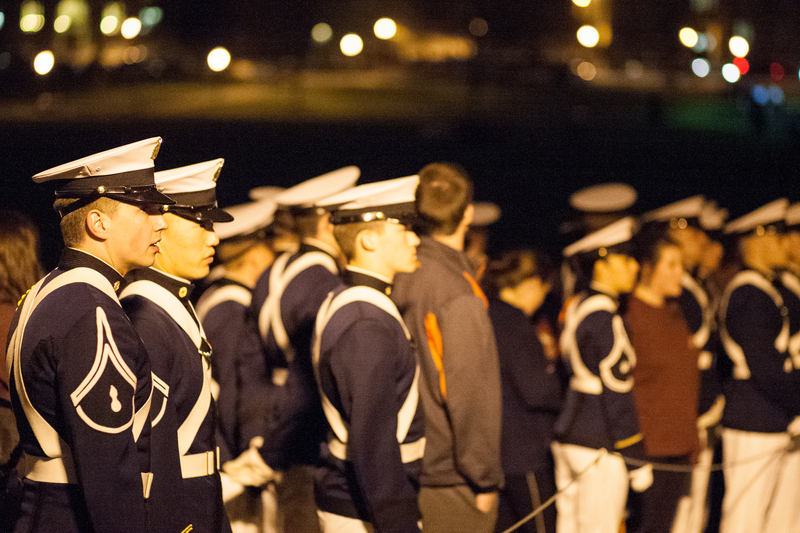 Cadets stand at the April 16 memorial during the candlelight vigil, April 16, 2013. 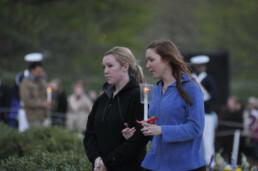 Relatives of Rachael Elizabeth Hill light a candle in her memory and walk toward her memorial stone, April 16, 2011. 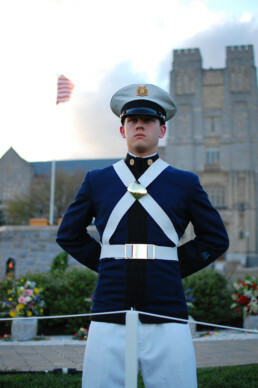 A cadet takes his post on top of the Pylons where he will play "Echo Taps" as part of a vigil, April 16, 2011. 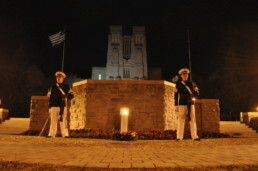 At midnight on April 16, a candle is lit using the burning candle in Burruss Hall, which would be on and guarded by Corp of Cadet for the next 24 hours, April 16, 2011. 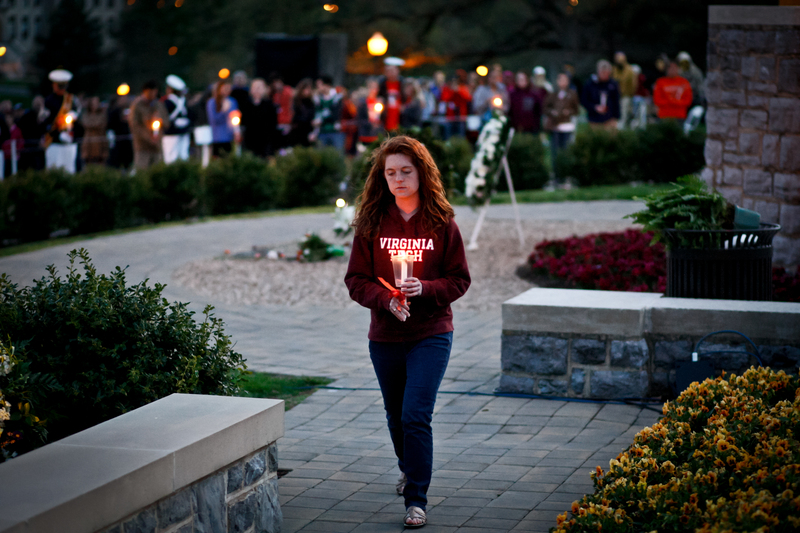 During the April 16 candlelight vigil, family and friends of the victims light candles recognizing the 32 students and facility who lost their lives in the April 16 shooting, April 16, 2011. 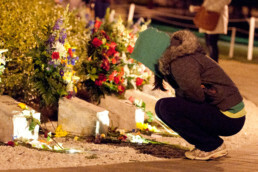 A couple stands at a candlelight vigil for the victims of the tragedy, April 16, 2011. 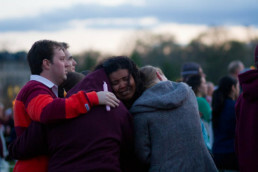 Students, community members and family members cry during the candlelight vigil, April 16, 2011. 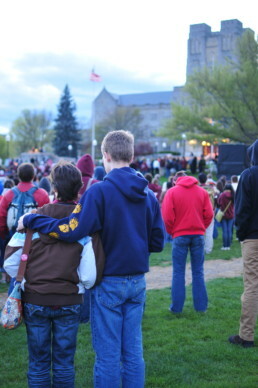 Students reflect on the vigil after most of the attendees had left, April 16, 2011. 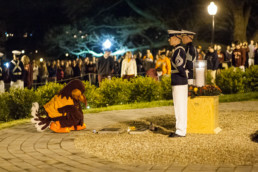 The HokieBird kneels in front of the April 16 memorial, April 16, 2013. 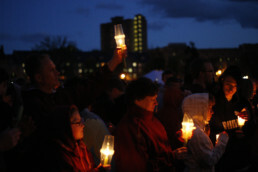 A candle for Leslie Geraldine Sherman is carried from the ceremonial candle lit at midnight, April 16, 2011. Students stand at a candlelight vigil for the victims of the tragedy, April 16, 2011. 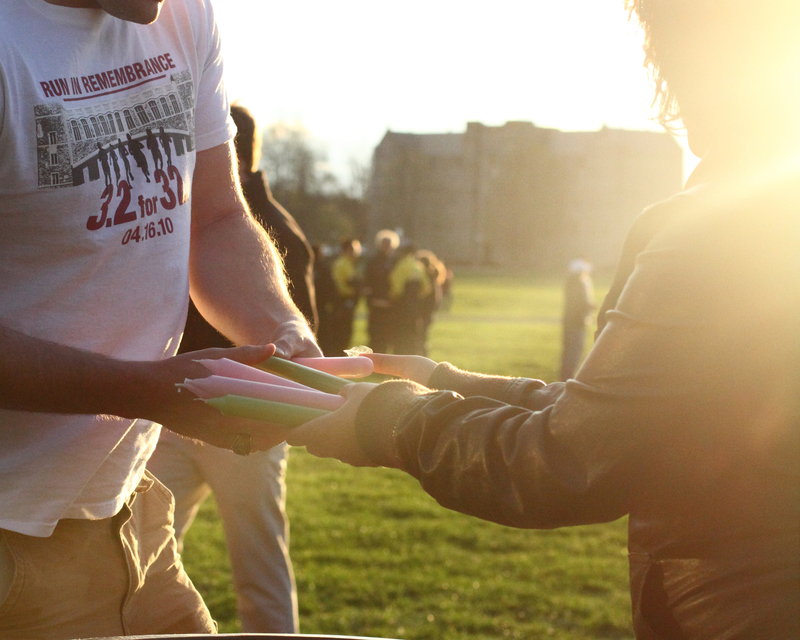 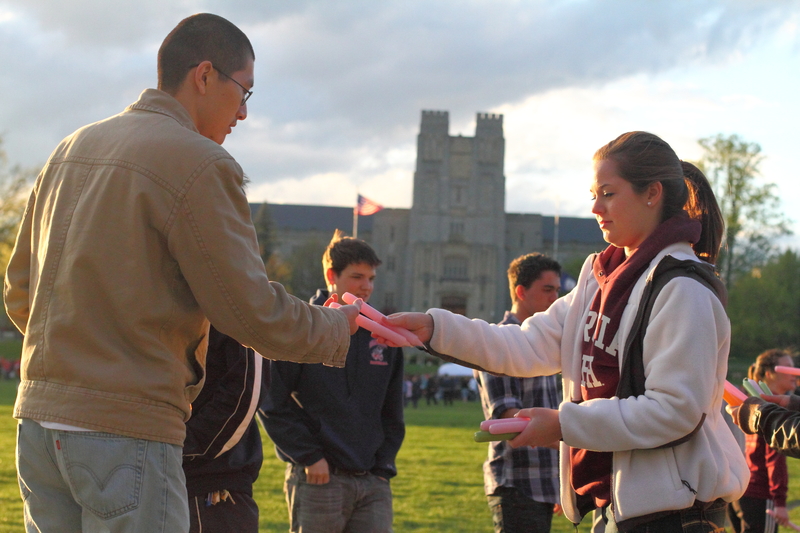 Volunteer Natalie Cruise passes out candles to students on the Drillfield, April 16, 2011. 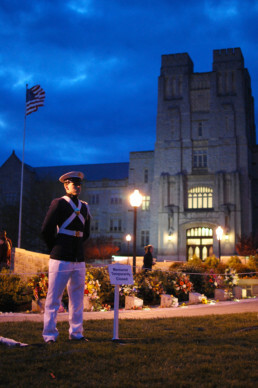 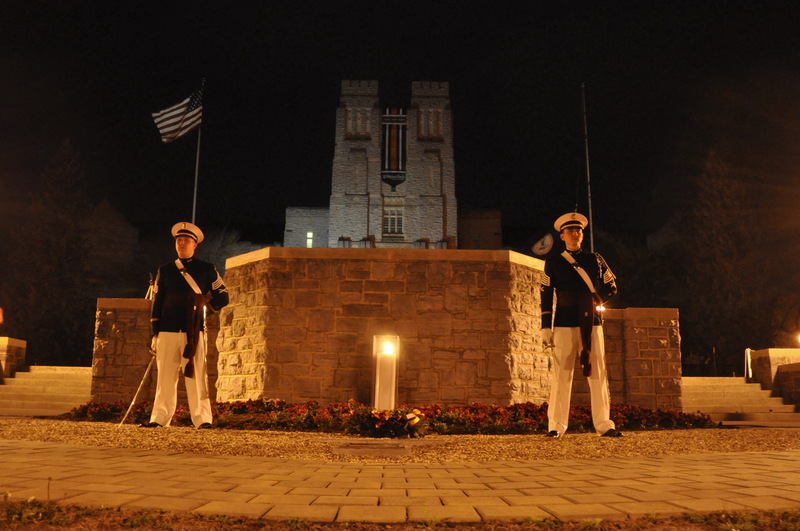 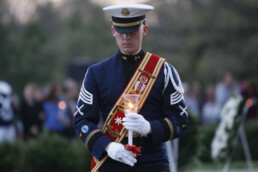 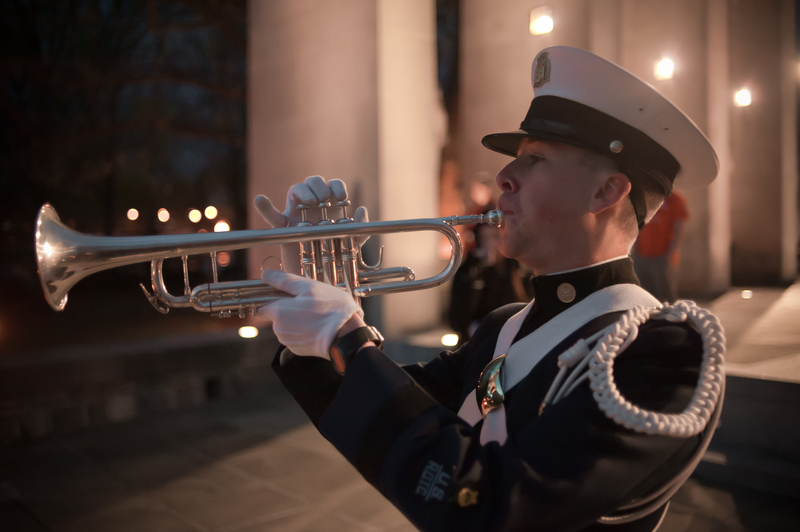 A member of the Corps of Cadets stands guard at the April 16 memorial in front of Burruss during the candelight vigil, April 16, 2011. 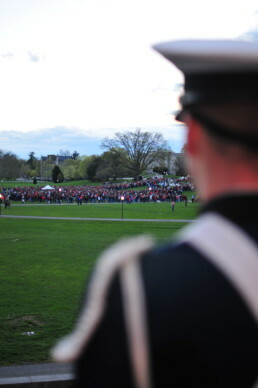 A Corps of Cadets bugler plays Echo Taps after all of the names are read, April 16, 2011. 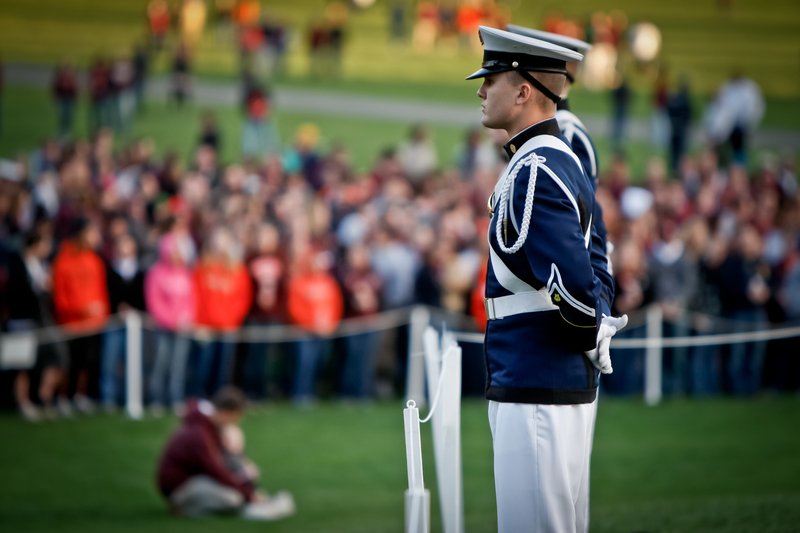 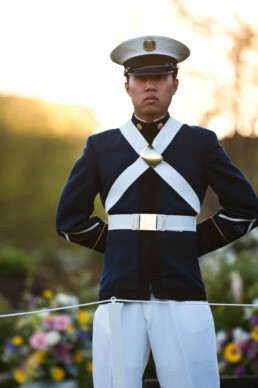 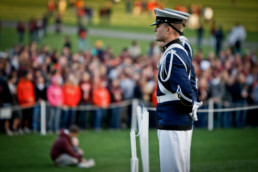 A member of the Corps of Cadets stands guard at the April 16 memorial in front of Burruss Hall, April 16, 2011. 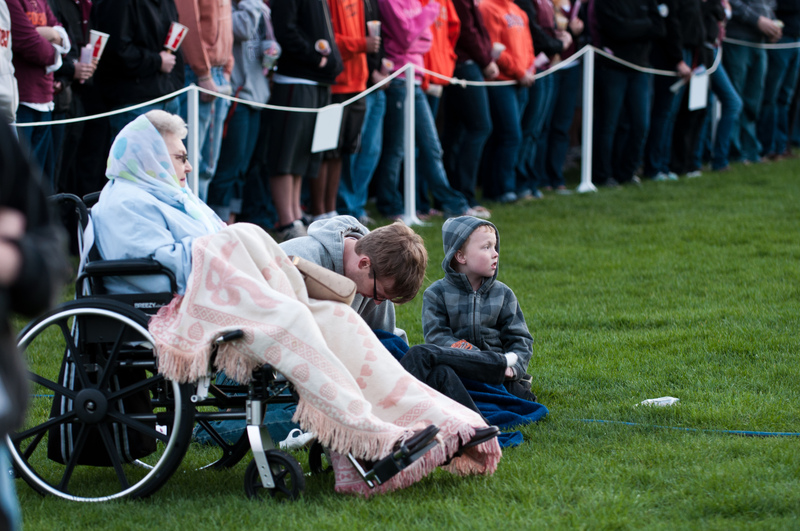 Phyllis Cook, mother of one the survivors of April 16, 2007, attends the 4-year anniversary of the tragedy, April 16, 2011. 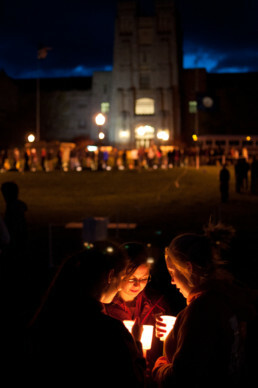 Students and families stand at a candlelight vigil for the victims of the tragedy, April 16, 2011. 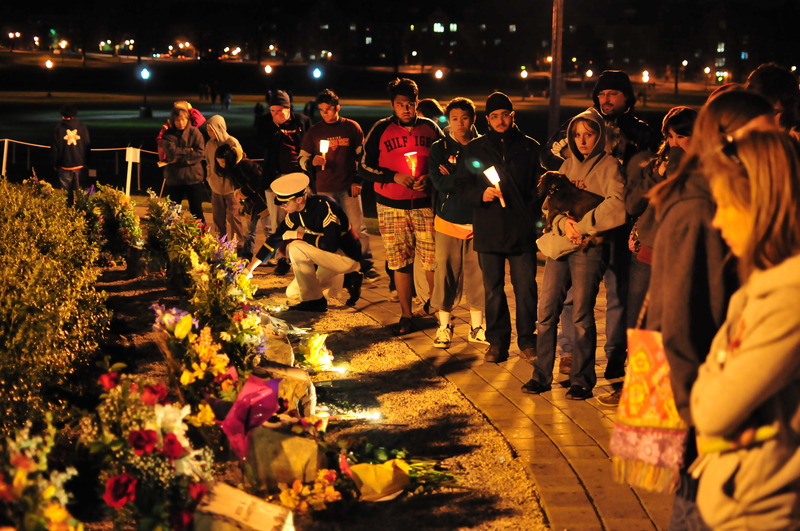 Students, community members and families stand in front of the April 16 memorial, April 16, 2013. Students gather in front of the April 16 memorial, April 16, 2013. 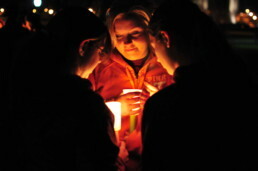 Students with candles from the vigil sit at the Pylons after a vigil, April 16, 2011. 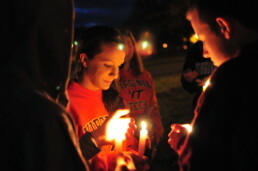 Students light their candles at a candlelight vigil, April 16, 2011. 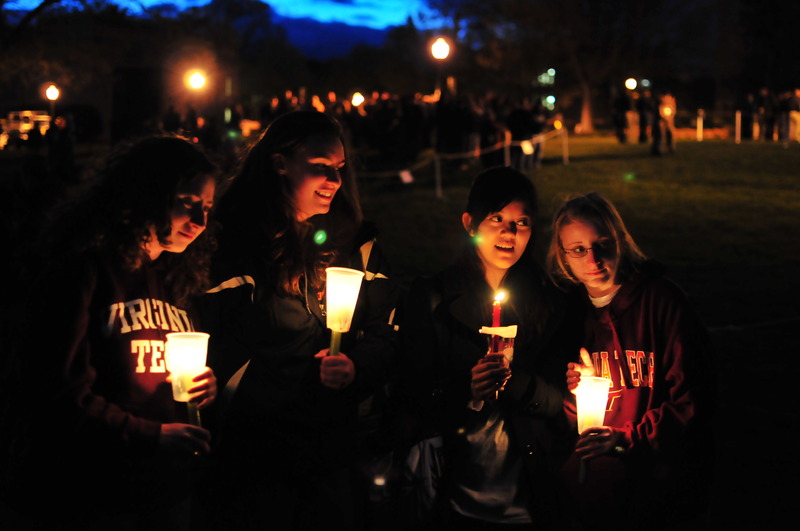 Students pass out candles at a candlelight vigil, April 16, 2011. 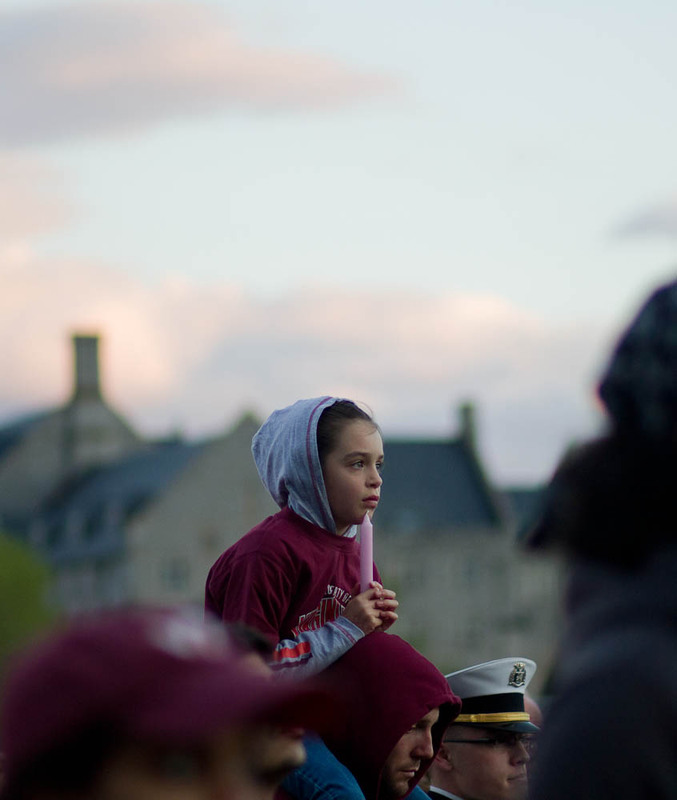 A cadet stands on the Pylons as students gather for a candlelight vigil, April 16, 2011. During an April 16 candlelight vigil, family and friends of the victims light candles recognizing the 32 students and facility who lost their lives that day. 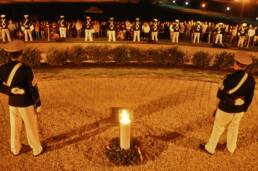 Cadets and civilians stand in front of the April 16 memorial, April 16, 2013. 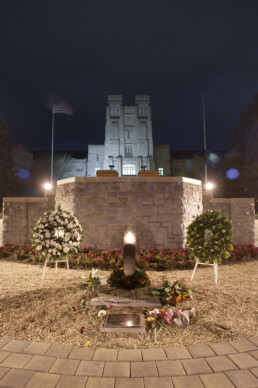 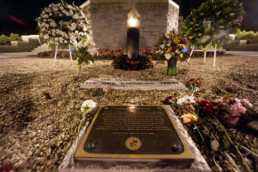 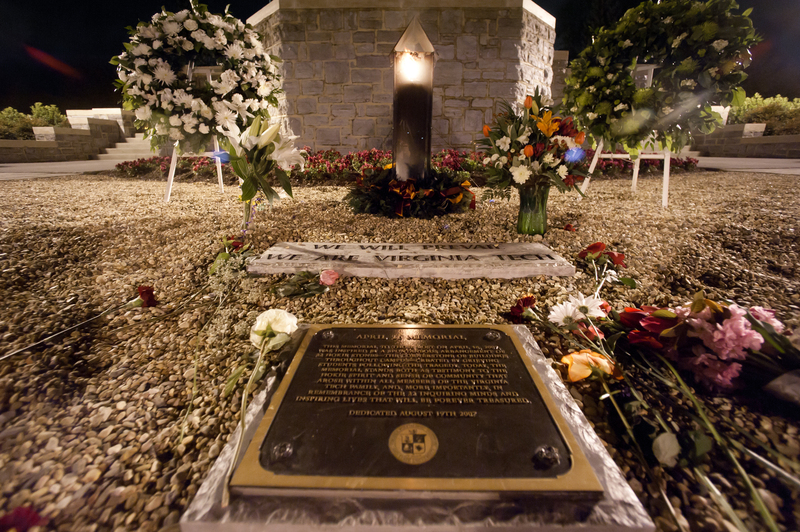 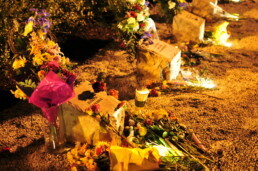 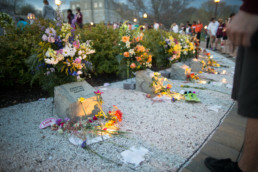 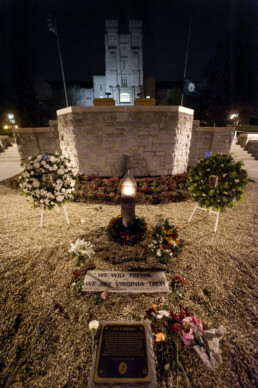 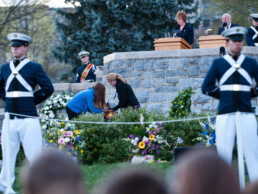 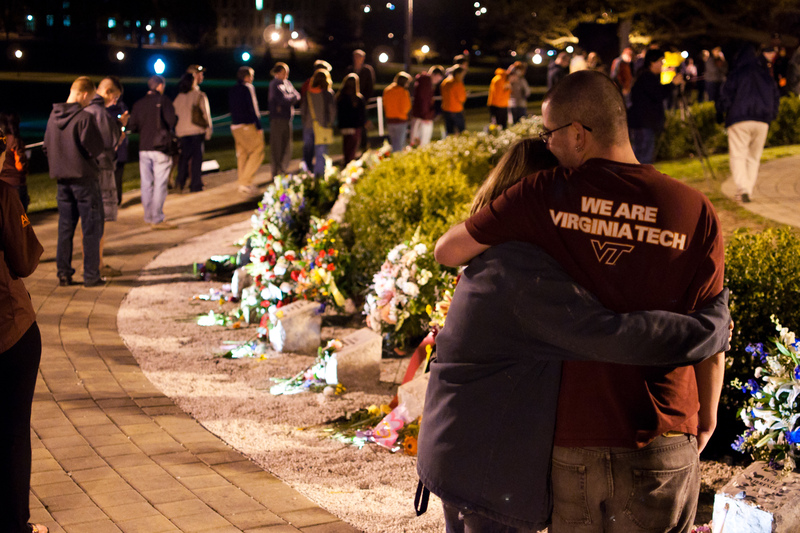 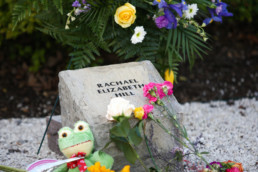 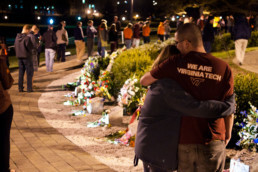 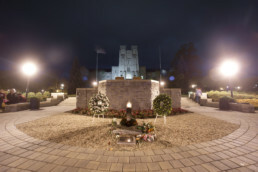 Former Virginia Tech student Rachael Elizabeth Hill's memorial is decorated with flowers at a candlelight vigil, April 16, 2013. 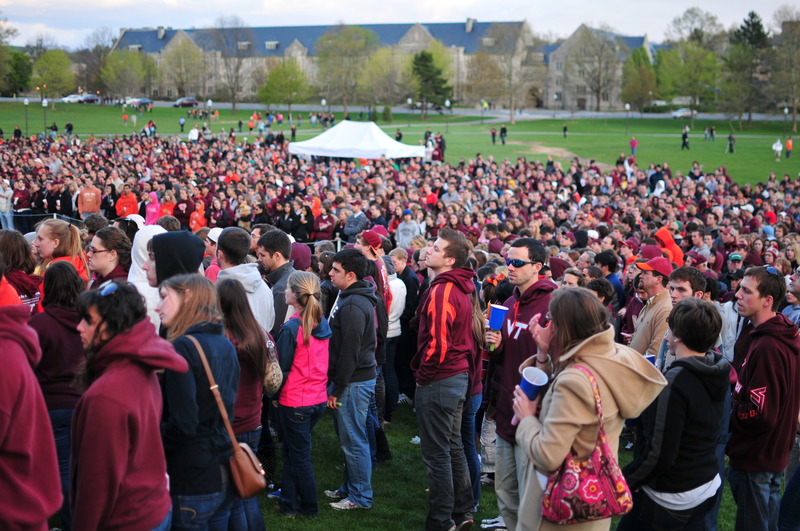 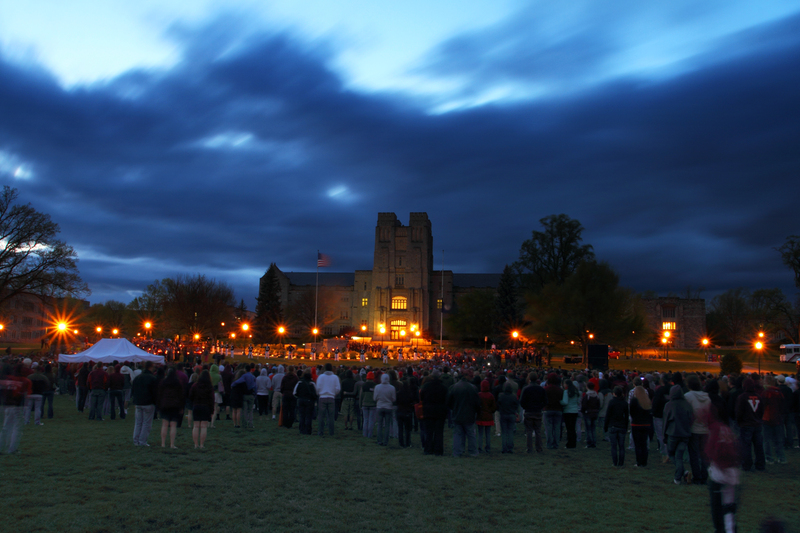 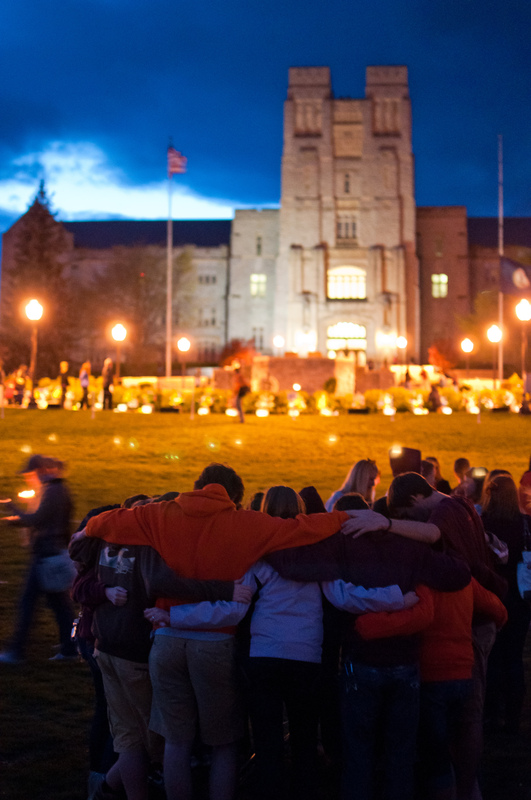 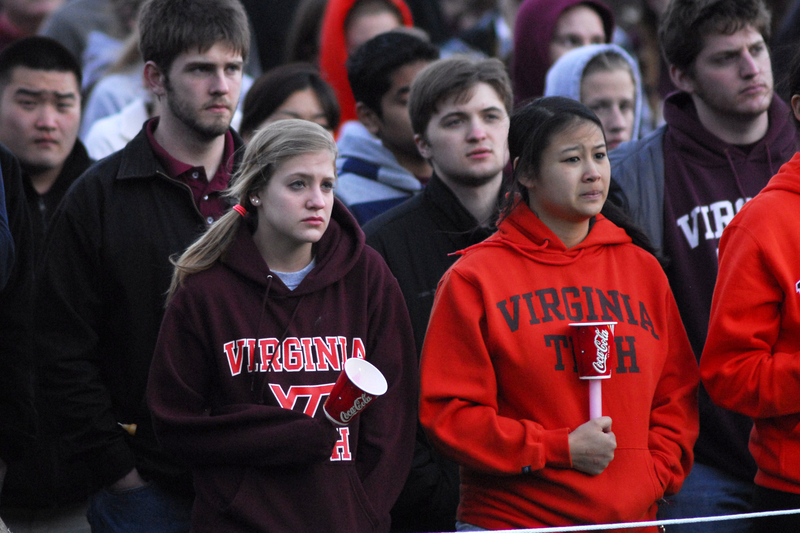 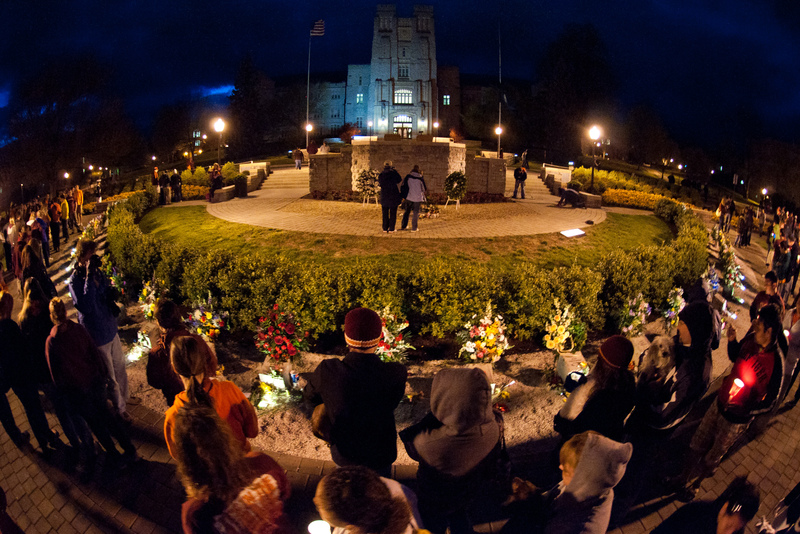 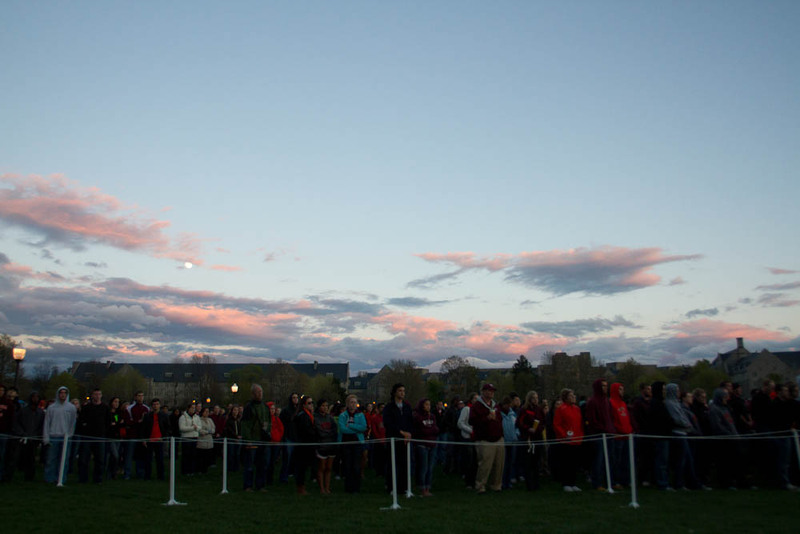 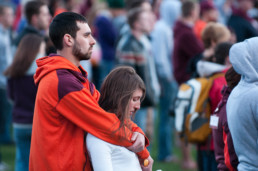 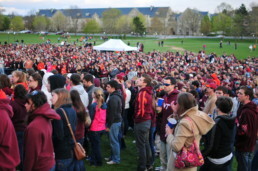 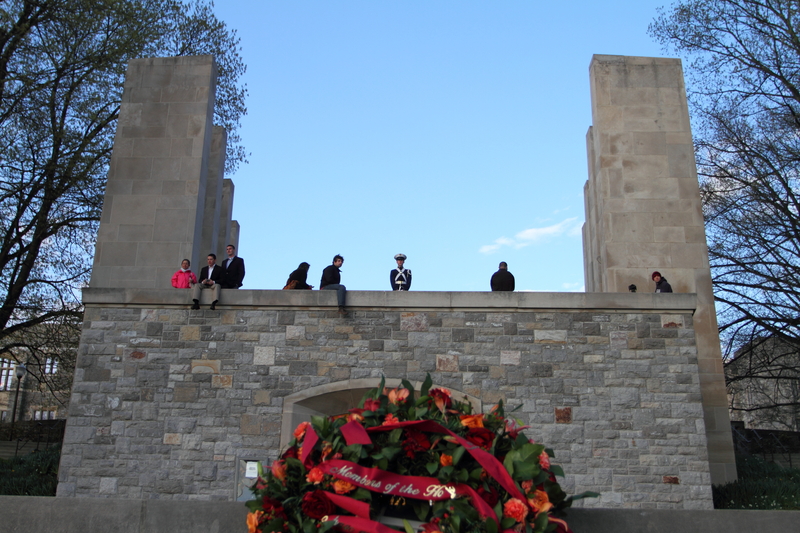 The Hokie Nation congregates around the April 16 memorial on the Drillfield, April 16, 2011. 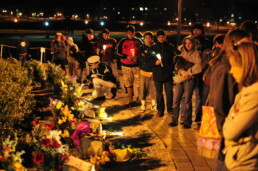 Friends or relatives of the victims of April 16 standing near the memorial on the 4-year anniversary, April 16, 2011. 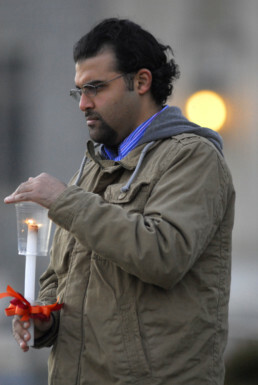 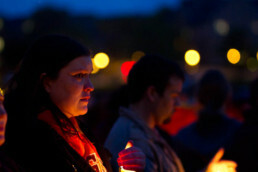 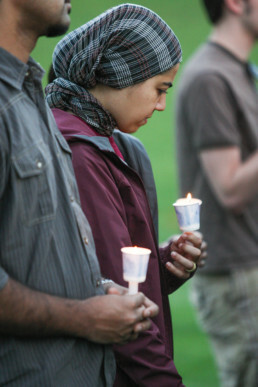 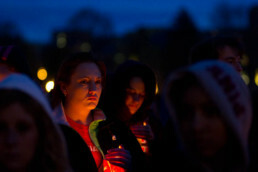 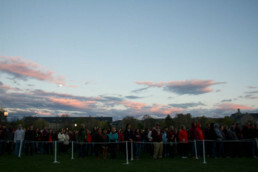 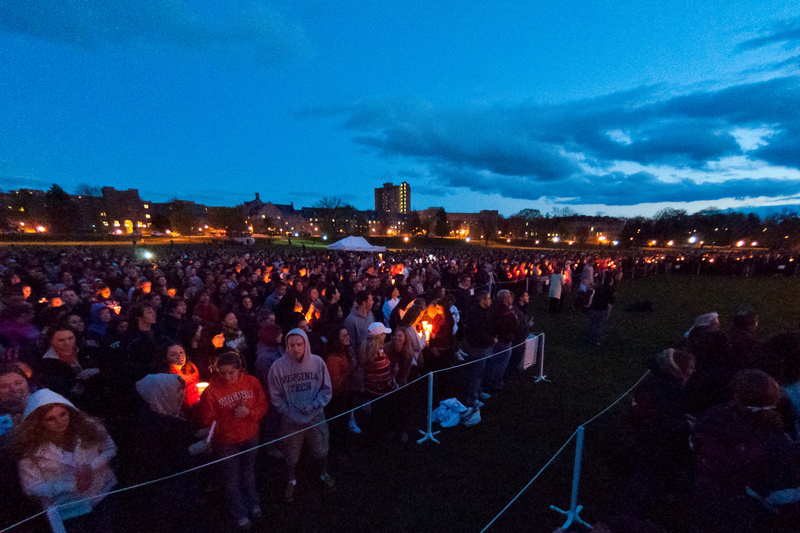 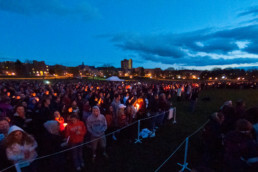 A candlelight vigil takes place on the Drillfield, April 16, 2011. 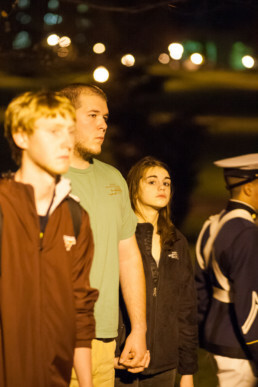 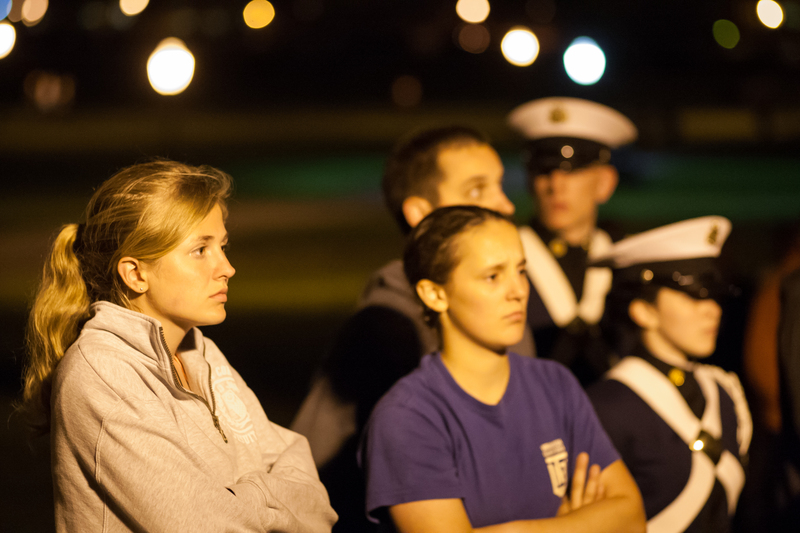 Students stand in silence at an April 16 candlelight vigil held on the Drillfield in front of Burruss, April 16, 2011. 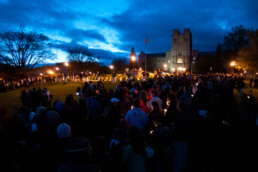 The light begins to spread among the crowd during the candlelight vigil, April 16, 2011. 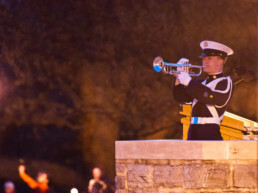 Freshman Taylor Montgomery, a university studies major and a member of the Corps of Cadets plays Taps in echo, April 16, 2011. 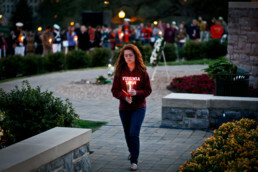 Students, families and community members gather for the candlelight vigil April 16, 2011. 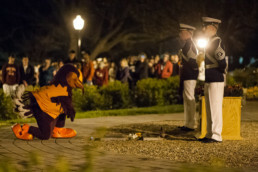 The ceremonial flame burns in the middle of the memorial for the victims of April 16, April 16, 2011. 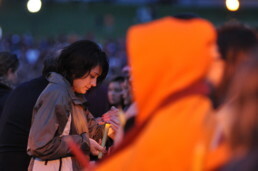 Relatives or friends of the victims of April 16 help others to light their candle, despite the windy weather, April 16, 2011. Patrick Bates, drum major of the Corps of Cadets regimental band, carries a candle in memorial of Matthew LaPorte, a cadet killed during the tragedy, April 16, 2011. 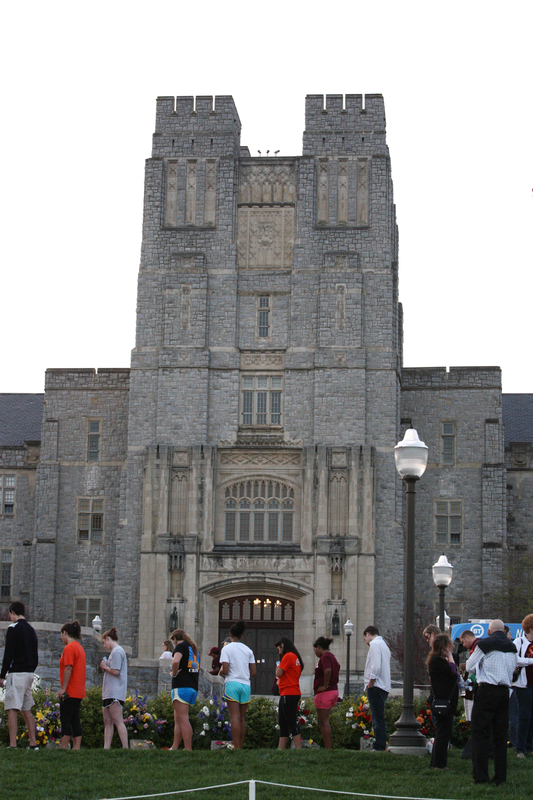 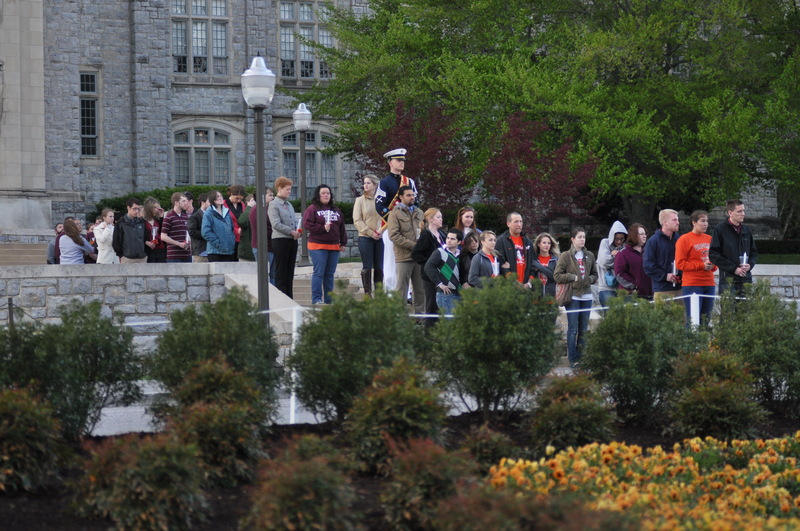 Students stand in front of Burruss Hall and the April 16 memorial during the candlelight vigil, April 16, 2013. 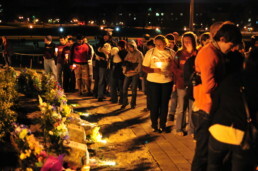 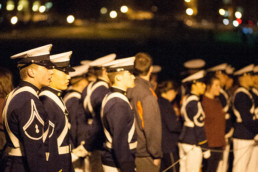 Students stand in front of the April 16 memorial during the candlelight vigil, April 16, 2011. 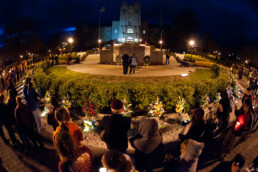 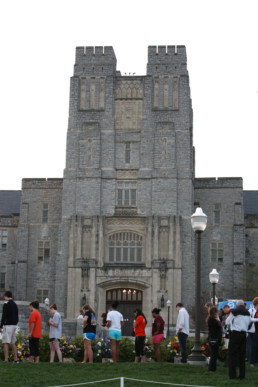 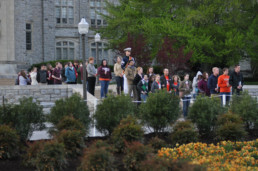 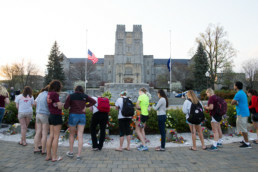 Students walk by the memorial in front of Burruss Hall during an April 16 vigil, April 16, 2013. A woman sits on the Drillfield during the candlelight vigil, April 16, 2011. 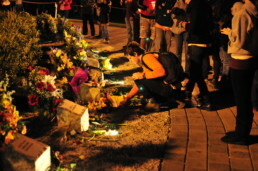 Flowers are placed at the memorials for the individual students lost, April 16, 2011. 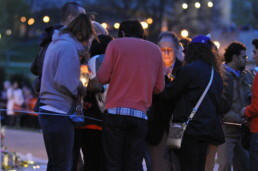 People look at the markers for the 32 victims of the shootings, April 16, 2011. 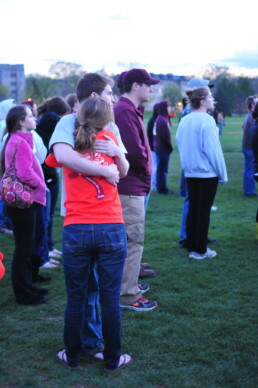 A couple hugs while looking at a marker at a candlelight vigil, April 16, 2011. 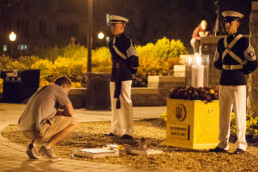 A student squats by one of the markers for a victim of the tragedy, April 16, 2011. 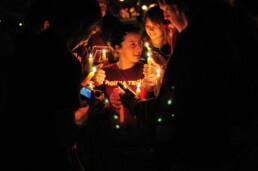 Student huddle at a candlelight vigil, April 16, 2011. 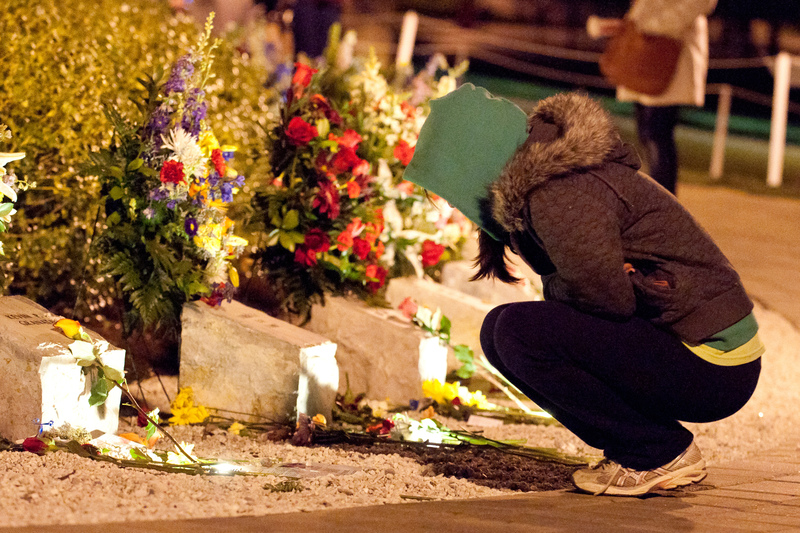 During an April 16 vigil, students walked through the memorial, April 16, 2013. Students stand during the candlelight vigil, April 16, 2011. 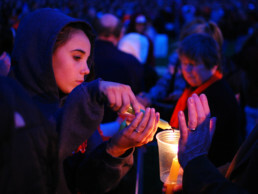 A family member of one of the April 16 victims helps a student light her candle, April 16, 2011.